These are the best spy shots of the Aperta we've seen yet. Well, it looks like the LaFerrari Aperta has been caught testing out in the wild once again. Last week, spy photographers captured a different, red Aperta . This time, spy photographer Magazin ProDriver CZ captured a different development car (black this time) testing in Paris, France. It would appear that this development car is a bit more put together than the red car we saw last week. Rumors suggest that Ferrari shipped the car to Paris for an owners-only preview event. While both spy shots look very similiar, if you look closer you can spot a few big differences between the two. On this car there is a 70th anniversary badge affixed in front of the rear wheels. The badge is also a nod to the V12-powered, open-top 1947 Ferrari 125 S, which was released 70 years ago next year. Moving forward to just behind the front wheels we can see a new aerodynamic device that sits about mid-fender. While we don't know the specifics of how the device functions just yet, we do know what the purpose of it is. 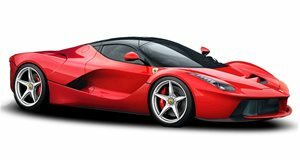 The device was designed to help the Aperta cut through the air with the same or similar coefficient of drag as the hard-top LaFerrari. By installing such a device, Ferrari is able to lower the Aperta's drag coefficient and enable the car to reach the same 217 mph top speed as the LaFerrari. This Aperta also features contrasting red pinstriping like we saw in . And interestingly, the car appears to be driven sans windshield onto the trailer (a trick of the camera lens?). Check out the spy photos for yourself and see if you can spot anything we missed!